This luxurious leather theater seating group will be a stylish addition to your family room or home theater. High back cushions with padded headrests, and deep pad over chaise reclining seats give the reclining chairs full body support, for the ultimate in relaxation as you watch your favorite movies or television shows. 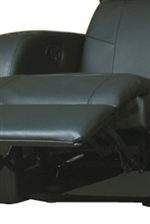 Inside arm recliner release buttons won't compromise the sleek style of this group, in rich black leather match with wide track arms. Wedges between seats offer arm support, with hidden storage for books, magazines, and remotes, and built in cup holders for convenient storage of beverages. Configure this theater seating group however you like to fit your room and meet your needs. The Cyrus Contemporary Leather Theater Seating with Wedge Consoles by Coaster from Nashco Furniture - Nashville. We proudly serve the Nashville, Franklin, Brentwood, Clarksville, Green Hills, Davidson County, Williamson County, Tennessee area. Product availability may vary. Contact us for the most current availability on this product. 600002 Wedge 2 16" 20" 23"
600001 Recliner 3 33" 38" 39"
Fabric Options Black leather match. Tailoring Clean contemporary tailoring with accent stitching. Frame Construction Sturdy hardwood frame. Seat Support Sinuous spring support base. The Cyrus theater seating group will give your contemporary family room or home theater a sophisticated style. These comfortable reclining seats have high back cushions and deep pad over chaise seats, with sturdy hardwood frames and sinuous springs for long lasting support. Wide track arms in sleek black leather match complete the cool contemporary look. Configure these theater seating pieces any way you like to fit your space and meet your needs. The Cyrus collection is a great option if you are looking for Contemporary furniture in the Nashville, Franklin, Brentwood, Clarksville, Green Hills, Davidson County, Williamson County, Tennessee area. Browse other items in the Cyrus collection from Nashco Furniture - Nashville in the Nashville, Franklin, Brentwood, Clarksville, Green Hills, Davidson County, Williamson County, Tennessee area.